Bless 3D printers, which let people fulfill dreams of owning items that previously didn't actually exist—provided they know how to model them in the necessary software, that is. 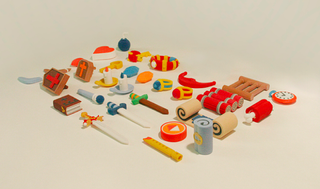 In this case, Hyrule Foundry set out to print, in full color, all the items from the original Zelda. And you can see the printed out results in the first image in this post. When it arrived and I beheld the box, I immediately thought, ok, hope this was worth it. As I began to unwrap, each piece in its 3D brilliance brought back a flood of memories from my childhood of playing the golden game. Each time I had collected each of these items from their various hiding places and dungeons I had wanted to hold them and now finally I could. I held the wooden sword in my hand and I said, this is it, the sword that started it all, the very first sword that we witnessed Link yielding. I was satisfied with the results and was ready to share them with you, my fellow Zelda fans. Not all of the items are done though—the potions and the arrows are being troublesome, but it sounds as if those are just a matter of time. Otherwise, you can purchase these print-outs from the Hyrule Foundry store, and they come in different sets to accommodate different budgets. Neat.